“The Recruit” opens with three pilots trying to deliver Intel to the Resistance. One pilot tells the others to turn back and he’ll do it. Soon, First Order vessels catch up to him and damage his ship, but Poe Dameron arrives and saves him. The young pilot introduces himself as Kazuta Xiono, the son of a senator. Poe brings him back to a Resistance ship, leaving him to explore as he meets with Leia Organa via hologram. However, Kaz eavesdrops and sees the general. He asks Poe to take him on a mission, and after some back-and-forth, he agrees. On the planet of Castilon, they meet with an alien woman named Aunt Z and her associates in her restaurant. Poe goes off with a man named Jarek Yaeger and leaves Kaz in the restaurant. Kaz soon gets himself in trouble by losing a game of darts. However, the two guys after him inadvertently start a fight amongst all the patrons, until Poe and Yaeger come in and break it up. Poe leaves for a mission, telling Kaz to send him reports of what happens. Kaz’s friend Neeku volunteers him to challenge in a pod race and prove himself a worthy flier. He gets to choose his own opponent and selects a young girl named Torra, which turns out to be the wrong choice. Neeku and Yaeger offer Kaz the use of a ship called the Fireball in the race. Yaeger’s mechanic Tam is angered by this, saying she was supposed to be able to fly the Fireball. Yaeger gives Caz a long list of parts he’ll need to get the Fireball running. At the race, Kaz disobeys Yeager’s advice and pushes the Fireball beyond its limits. Nonetheless, he survives, earning the respect of Torra. Yeager offers him a place to stay and a position in his garage Colossus. In “Triple Dark,” the crew works on the ship of a man that Kaz believes is working for the First Order. That night, Kaz decides to go searching for signs of the First Order and tangles with the guy to whom he lost at darts. BB-8 helps him escape, but he makes it back to Yeager’s shop late. He finds out that the man with the ship is a spy for pirates rather than the First Order. A plethora of pirates descend on Colossus with only the racers to fight them off, but somehow good prevails. Kaz tries to tell Yaeger that his client was a spy for the pirates, but Yeager seems uninterested in the revelation. In “Fuel For the Fire,” Kaz struggles to balance work at Colossus with racing and his mission from Poe. He drops the engine he’s been working on over the edge and nearly destroys it. Frustrated, he wanders off and meets a group of young mechanics led by a racer named Rucklin. Yeager chastises him for taking too many breaks and not completing his work on time, but Kaz feels that he’s being treated unfairly and that his job is taking too much time away from him. Rucklin and his gang pressure Kaz into taking him into Yeager’s secret office so he can get a look at some rare hyperfuel; he agrees under the assumption that they’ll only be looking at it. Of course, as soon as Kaz’s back is turned, Rucklin steals the fuel. Kaz discovers that Yeager was once in the Resistance and that he had a wife and daughter. Rucklin uses the fuel in his ship, which causes it to explode, but Kaz saves him just before the blast. However, Rucklin is not grateful and blames Kaz for his ship blowing up. Yeager allows Kaz to work outside so he can watch the race, but this leads to the engine falling over the side again. It’s no secret that the new Star Wars trilogy installments, as well as the offshoot Star Wars stories, aren’t my favorite thing in the world. As such, I was somewhat disappointed when Star Wars Rebels, the last title in the franchise that I enjoyed, ended and Star Wars Resistance was announced. The animation in the first-look clip released by Disney looked terrible, Poe Dameron and BB-8 were featured heavily, and the title seems redundant. Why have a show called Rebels and then one called Resistance? That’s the same thing. I know that in the movies they differentiate the Resistance from the Rebellion and the First Order from the Empire, and that’s the real reason, but I think that’s dumb anyway. Giving two identical things different names doesn’t suddenly make it creative and different. It’s still a remake. Regardless, I did want to give Resistance a fair chance. So far this century, animated Star Wars output for the small screen has consistently outshone the live-action cinematic offerings. Resistance was conceived by The Clone Wars and Rebels creator Dave Filoni, though his work on it was less hands-on due to his simultaneous creation of the final season of The Clone Wars for Disney’s new streaming service. Star Wars Resistance was influenced, he says, by anime and what his grandfather experienced in World War II. Given the somewhat abrupt ending of Rebels, I can’t help wondering if Disney and Lucasfilm only really wanted Resistance so they could have a TV show to coincide with the new trilogy, as The Clone Wars went along with the prequels and Rebels occurs right before the events of the original trilogy. The difference, based on what I’ve seen so far, lies in the characters more than any of the superficial trappings. After all, The Clone Wars and Rebels don’t exactly have gorgeous animation either; CGI for TV is rarely impressive. The Clone Wars gave fans Ahsoka Tano, one of the most beloved characters outside of the original trilogy and the second best female Star Wars character ever to grace the screen. The show also managed to flesh out Anakin and Obi-Wan and give greater meaning to their film appearances. Rebels created a whole crew of lovable characters, most significantly Kanan Jarrus. Resistance only has a few episodes out so far, so I’m not drawing any permanent conclusions just yet. However, based on these first four episodes, I really, really do not like Kazuta. One could argue that The Clone Wars and Rebels protagonists Ahsoka and Ezra were annoying and childish at first, but they were sympathetic and showed talent and promise. Kazuta is interested in the Resistance and in flying, but he’s not a particularly good spy, and he’s a terrible mechanic, as they keep emphasizing. That’s okay, provided it leads to character growth later on, but for now, he’s annoying. He also doesn’t seem to fully appreciate what Yeager is doing for him, even though the latter keeps explicitly stating that he’s putting himself at risk, and Kazuta seems to go out of his way to draw attention to the situation. If Poe really is so intuitive about these things, and he thinks Kazuta shows potential as a Resistance operative, they should show us what makes him think so. Thus far, we’ve seen nothing impressive about Kazuta save his ability to disobey orders and hurt the people around him. The trailer for Star Wars: Resistance made a big deal out of Poe and BB-8, but so far Poe is only in the pilot, though he leaves BB-8 to watch Kazuta. This doesn’t really feel right after such a strong bond was established between the pilot and his droid in The Force Awakens. In “Triple Dark,” they tease Captain Phasma, and her armor is the only thing in any of the four episodes that looks good. It looks better than good, in fact; this is a really gorgeous shot, and it’s strange that it’s surrounded by animation that otherwise looks like unfinished production art. A similar medium was used for Netflix’s The Dragon Prince and the anthology film Extraordinary Tales, but the use of colors and shading in those made the characters and environments look dimensional, and the visuals there ended up being surprisingly effective. Resistance looks like something that was pushed out while the animators were still working on it. As is, the animation reminds me of the first Toy Story; they don’t look similar, but similarly, the only textures that really look right are plastics and metals. Resistance doesn’t rely quite as much on nostalgia as I had feared, but it does feel like the characters of Poe and Leia were shoehorned in just to excite fans. It would be more effective if they were either more major characters, or if their reveals were saved for later on in the show. Instead, it’s just like, “Oh, look, they’re trying to tie in with the movies,” but it’s not exciting and it doesn’t enhance the story. The characters of Neeku and Kazuta also show some level of ineptitude when it comes to writing interesting characters. Neeku is a very literal person, misunderstanding each of Kaz’s jokes and speaking in a very monotonous tone, saying things matter-of-factly. This is neither funny nor charming; it’s just weird and distracting. If Neeku and Kaz are supposed to be friends and Neeku is supposed to feel betrayed by Kaz at Aunt Z’s, they need to establish some kind of personality and relationship between them. After all, these characters are new, unlike the tie-ins from the films. Yeager has the most potential to be an interesting and sympathetic character, and we get some hints in “Fuel for the Fire” of a tragic backstory for him. The few episodes we’ve seen thus far introduce numerous other characters, and honestly, they all kind of bleed together. After seeing the series pilot of Rebels, I could name the Ghost crew to a person without looking them up. Kaz, Neeku and Yeager are the only new characters in Resistance who really leave a mark. This may be the result of introducing too many characters too fast, another issue that could have been remedied by making Poe the lead, or at least one of the main characters. I plan on seeing where it goes from here, but so far, things don’t look great. Overall, Resistance is about what I expected. 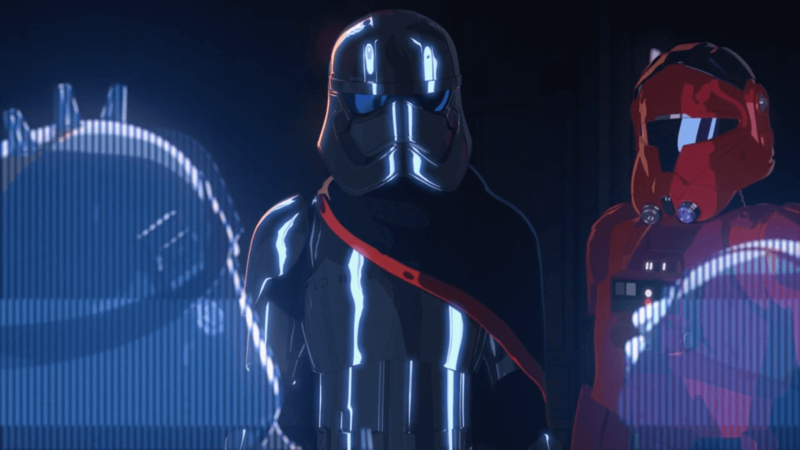 The animation is really ugly except for the sheen on Phasma’s armor and similar surfaces, the characters aren’t likable – and in fact, our hero is unlikable – and I don’t see why he should be the hero, anyway. Much like Rapunzel’s Tangled Adventure, I get the feeling that a group of subpar writers were saddled with a difficult job. I’d recommend Resistance, at least so far, to little kids or fans who like anything with Star Wars on the label. Otherwise, you’re not missing much. 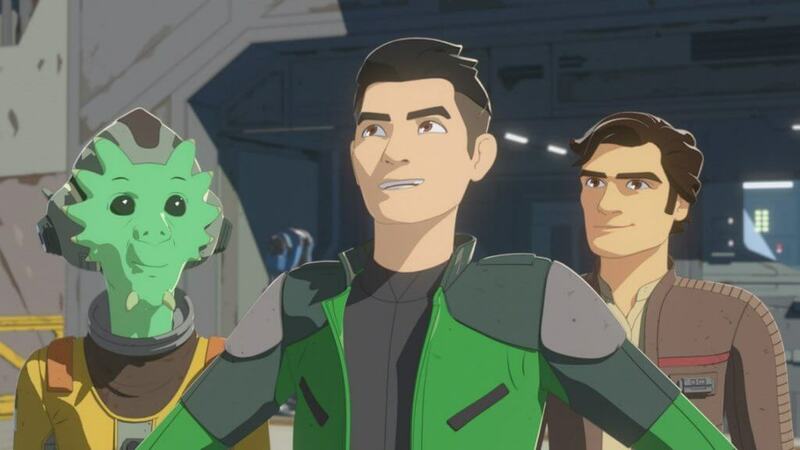 Star Wars Resistance - "The Recruit," "The Triple Dark" and "Fule for the Fire"